The California Ski-Orienteering Championships determines who are the best ski orienteers in California (even if they don't live in California) for 2004. To do this, we average the best two course placings that each orienteer has at our three California ski-O events and award the championship to the person with the lowest average in each class. Where there are ties, we prioritize the later events over the earlier events. We do this for each gender on each of five courses (white, yellow, orange, green, and blue). As usually happens, in 2004, nobody who did the beginner courses (white and yellow) came to more than one event as a single entrant. It isn't until people graduate to the intermediate level that they typically begin to attend more than one event a year. As a result, we had no champions for either of these courses. The orange classes each had a couple of qualifiers for each gender. For the women, Johanna Merriss was the early favorite to win this class when she took first place at Burton Creek, but she had to withdraw from the Royal Gorge event because of an injury and couldn't qualify. Trinka Gillis, who placed second at Royal Gorge, finished the season with a first place finish at Bear Valley and became the champion. For the men, Doug Bass competed in all three events and won the championship with a first place at Burton Creek and a second place at Royal Gorge. One other male qualified with lower placings and 17 others only attended one event. If more had attended a second event, the competition might have been tighter though Doug's speed is difficult to beat. The women's green class was tightly contested by Yelena Krasnov (a past champion) and Carol Schick-Lyda (a new comer to ski-orienteering). Both had first and second placings but Carol's first placing came at the most heavily weighted event (Bear Valley), an event skipped by Yelena, so Carol became the champion by a slim tie breaking margin in their average scores. For the men, only Bob Cooley and Bjorn Widerstrom qualified out of 8 participants at the three events. Bob competed in all three events, two with second placings which gave him the edge over Bjorn, who had second and third placings. The women's blue class had only one qualifier, Anna Voegele, who automatically won that championship with two first place finishes. She had competition (Julie Raymond, a past winner of this course) at only the Bear Valley event. The men's class, on the other hand, had a very active competition with 8 qualifiers. 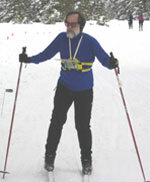 Although the competition was primarily between Chuck Lyda, formerly of the California National Guard biathlon team, and Dan Stoll-Hadayia, Matthias Kohler could also have won the championship had he placed ahead of the other two at Bear Valley. Matthias nearly did that but chose a route to control 4 at Bear Valley that added an extra 7 minutes extra to his time. That was a costly decision when you consider that he ended up just 43 seconds behind the other two. He could have been the clear winner and might also have beaten Neil Hunt, who ended up as the top skier for the day. Between Chuck and Dan, everything depended on who would finish ahead of the other. Each already had a first and second place finish at the earlier events. At Bear Valley, Chuck took the championship by finishing ahead of Dan by a very slim margin of 10 seconds after 89 minutes of hard skating. For the second time, Dan was barely edged out of the championship after doing some terrific skiing. To see how these people rated compared to the other participants, see the updated standings. Note that the later events are rated higher than earlier events to break ties and to encourage continued participation until the very last event. There will be some changes for the 2005 championships. To begin with, we might take on one or two new venues, one of them in Nevada. To allow for such a situation, we're probably going to change the name of the championships to the Sierra Ski-Orienteering Championships. In the past, it has been difficult for people to volunteer as director or course setter if they were hoping to compete in the championships. In some cases, that prevented some of the top ski orienteers from running our events. To make it easier for them to volunteer, we're going to change the number of events required for them to qualify for the championship. To encourage people to travel to our events, we'll let people outside California and Nevada use the same minimal qualifications. The following chart shows the number of qualifying events that will be needed for the total number of event days in a ski-O season. We can adjust these numbers with some discussion. With some weekends having two events (such as will probably happen at Bear Valley in 2005), it should be a lot easier for travelers to qualify by going to one ski-O weekend. We hope to be able to pair other events on the same weekend to minimize the amount of traveling required of most participants. We'll also further define what it means to be a California or Nevada resident to determine who qualifies for the reduced qualification requirements. For example, some people live in two locations or they take a leave of absence to work at a local university. Those people would essentially be California or Nevada residents for the ski-O season. We'll examine these situations more closely and will update the qualification rules. If you have any further ideas on how to make it more attractive for people to qualify for this championship, let me know. know so he can include you on the 2005 ski-O mailings. 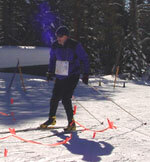 Setting up a ski-O event is typically easier than setting up other orienteering events because the courses are all on ski trails. Because of that, there are other considerations which we can help you work with. Also, if map changes are needed, we could probably have someone help you make those changes. This is a great way to break into event direction and course setting (and to do some extra skiing).